I love this Christian blogosphere. I've been so blessed and encouraged by the community of online friends. If I'm not careful though, it can steal my joy. There are many other writers who are far better than me. I let comparing myself to them lead me to believe I am not good enough. It's been a week of feeling ready to throw in the towel. The writers I associate with also have amazing hearts. They have hearts that give and give. They give both their time and money to places like Compassion International, World Help and most recently I've seen posts for Mercy House Kenya. I bounce from blog to blog and see writers I admire taking the leap to support these worthy causes. Soon I'm questioning where my heart is. Where is my heart if I don't choose to sponsor a child through Compassion International or World Help? Where is my heart if I cannot contribute even a small amount of money to Mercy House Kenya to help purchase a van? Before long, it's as though I've forgotten where God has called me to be. I forget about the ten days I spent in Guatemala serving alongside four different missionaries bringing God's hope to the Guatemalan men, women and children. I'm all too quick to minimize the work I do daily to support our military and their families. God calls us to be world changers. It's about doing what God has called you to do. Maybe He's called you to be a world changer in your child's school. Maybe it's within your church. Maybe it's serving the homeless in your community. Maybe it's caring for an elderly parent. Maybe it's being a mother. Maybe, for a time such as this, it's sponsoring a child through Compassion International or World Help. Ultimately, isn't it about doing what you can do right where you are to share God's love to those around you? Paul tells us in Romans 12:6, "we each have different gifts, according to the grace given to each of us." Instead of getting caught in the comparison trap we need to discover and embrace the individual strengths and traits God has given each of us. Together are individual strengths and traits form one body in Christ. Together we fulfill an important purpose. As members of the body of Christ, we need to encourage each other. The writers I admire do this for me; they encourage me in my walk with God. Anything else is the voice of the enemy. I've spent many years trying to be someone else so who I am can feel lost under many layers of masks. God is my hope. The more time I spend in His presence and in His word, the more I discover who I am. He is transforming me in to the new creation I am in Him. Be who God created you to be. Be only you. Reading this post has made the tears roll. Perhaps I should have told you sooner. It is because of you that I found courage to join Hello Mornings & volunteer for (in)Mercy. 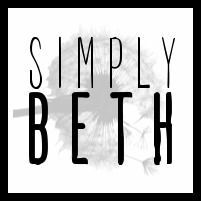 Beth, keep being you! You minister in ways that you have no idea. You truly have blessed me & encouraged me. Deeply. So yes, BE ONLY YOU! Joanne, thank you for your kind words this morning. They were a wonderful way to begin my morning. As I said in my comment on your page, I'm grateful God gave me words that helped you to join Hello Mornings and volunteer with (in)Mercy. You have been such a blessing to me my friend! Thank you. Kristin, thank you for your comment which encouraged me greatly this morning. I love how God planned are messages today. He is amazing isn't He? You are a blessing to me. I'm so grateful we have connected in this blogging world. I'm praying for those sponsorships! The comparison trap can be lethal to our hearts, can't it? The enemy just swoops in and tries to steal our joy and purpose. So glad you are you. Because life would be less beautiful without you in it. Thank you for your kind words Jen. I'm so grateful for this online community and the wonderful friendships being formed as we come together with a shared purpose of glorifying Him. Life would be less beautiful without you too!! Amen! Being who God has created and for His call is where we need to be pointed and walking. I, too, have tried to be what others are, who others are, and it has come to no good, for I was made by Him and for Him. I must follow the One and Only. Oh, Beth, it has been my hardest lesson in this life. Praising you for writing this as I needed that reminder. I feel lost right now and need to be still and listen so I hear His words for me! Hello dear Linda. I'm always grateful to see you here. Your comments also give me much encouragement. Thank you! I love the words you shared, "I was made by Him and for Him." Amen!! Lifting you up in prayer my friend. Janet, I strongly believe God leads us to each other for a reason. It's been a short time since we have connected and I'm so blessed by you and grateful God has placed you in my life. Even if only currently through this blogging world. Reading you share about my baptism gave me goosebumps again and reminded me how I felt as I came out of the water. He is my joy! Thank you for how you have encouraged and inspired me. I have a big smile on my face because of you! Wow! So true! And please don't ever throw in the towel- your words are so encouraging. You aren't alone in the comparison pit, but I thank God that He gives us His word to show us who He really is and who we really are:) "The more time I spend in His presence and in His word, the more I discover who I am. He is transforming me in to the new creation I am in Him." Amen. Thank you, Lauren. I know this comparison trap is something the enemy tries hard to trip us all on. Thanks you for your kind words and thank you for being a part of Three Word Wednesday today. Blogger envy has a way of creeping up on you. There are some many people doing good things but the comparison game has a way of stealing the joy of doing what God has called us to be doing. I have to remind myself stay within my own lane. He graces us with what we need for His assignment. I couldn't think of three words this week my thoughts have been so scattered the last couple of days. I look forward to joining you soon. Wanda, I will be praying for you as I understand completely what it feels like to feel a bit scattered. Thank you for stopping in. I look forward to having you join in for future weeks. Much love to you. I so get this. Just last week I was wondering (again) why I wasn't picked along with other bloggers to do something. I hate that I even just admitted that. I think we all fight this comparison trap. It's a trap because our enemy does not want us to walk in our own unique gifts and talents. You are a ray of sunshine my friend, a light to this world. I am so grateful I found you through the 5MF. I am thankful for our friendship. Hugs! There are so many women called to minister internationally. I admit to feeling a type of guilt because I have not - but then I have to remember to bloom and minister where I am planted. Not all are called to international ministry - there are so many youth here who need to be reached and loved and introduced to a loving God - who people say, "Oh, there are people with greater problems than they have" - yet by our neglect - these teens/youth become unreachable. 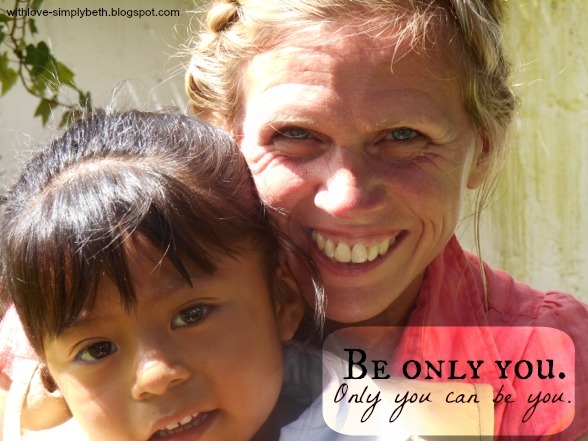 It is a huge mission field right on our block, in our schools - on the streets of our communities:) Wonderful post on perspective of what each of us has been called to - and to not compare!! Thank you for stopping in and for your encouraging words. I too need to remember the words you shared, "to bloom and minister where I am planted." I couldn't agree more; there is a huge mission field right here. Many times all we need to do is cross to the other side of the street and there we will find someone in need of God's love and compassion. I'm grateful you came by and shared. Blessings to you. You always touch my heart friend! THANK YOU!! In the blog world it is SO easy to compare ourselves with others. She has a nice blog design, she has more followers, her words are more eloquent, and on and on. But God has called us to write. Our words will sound different because God made us different. Our followers will be different because God is calling us to reach different people. We have to learn to focus on His unique calling for us. I have experienced this struggle over and over while blogging. I am learning to be who He made me to be. God bless! It's nice to "meet" you too, Jenifer. Thank you for stopping in and for your encouraging words. Hi Beth! We have supported a boy from Africa for several years now. We get occasional letters and photos, and it's so fun to see this boy grow! We have so much compared to others, and they need our help. You are so right about that. It is a joy to visit these blogs and be filled with grace we don't even realize we are getting. I was talking to a friend who wants to re-connect with God, but didn't know if God was listening to her. The sure-ness that was in my voice about that surprised even me! I think being a part of the blogging community for 3 months has changed my spirit for the better. You are a part of that change. Thank you for sharing your faith here! 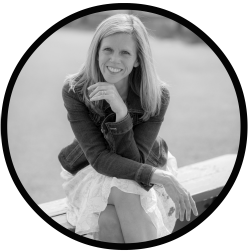 Hi Beth, As so many others have said--we all get caught up in the blog comparison and start listening to the lies of the enemy that we don't measure up, or we have to do more, or our hearts are not as transparent and gentle as the next writer. I know because I have been hearing the same voices and wondering why I do this. But at the same time, I'm asking the Lord--just what do you want me to do? That's a hard one because it may be that the Lord has a different goal for me than the one that I want to pursue. So I'm seeking. Be assured that you are a blessing here and your new design draws people in just as your heart does, Beth. I love coming here. "Be who God created you to be. Be only you." Beth, there's the answer to the comparison monster. We can only be and do what He's created us to be and do. When we step outside of those lines, we get in trouble. And He sure knows how much I have done so! Thanks for the reminder, Beth. Snapshot Love—he's home and more. Three Word Wednesday: He loves me.